Whether you're madly in love or enjoying the single life, Happy Valentine's Day! this is probably the very first Valentine's Day that I don't want to vomit or consume an entire bottle of wine! It's official- I am living a happy life and don't need the love of a significant other to feel complete (although, that would be nice) happy valentines day to you too love! Happy Valentine's Day, sweets!!! 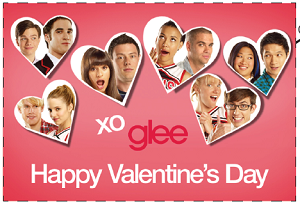 Didn't you love the V-Day glee episode last week??! Happy Valentine's Day to you, too! And...yes, I too LOVED the Glee episode last week! !